Welcome all Lakewood Enthusiasts to the world of our Lakewood custom shop! 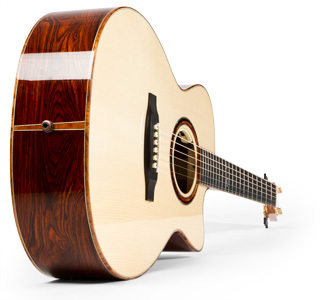 The Lakewood custom shop is a well-established institution, unique in the acoustic guitar world. We offer a wide selection, reliability and a respectful service ethic which we consider to be part of each individual order. Your desires are realized by way of the highest standards of lutherie and a total commitment to craftsmanship and quality. One does not have a custom shop guitar, a bespoke individual instrument, built every day! For this reason, we are available to you from the beginning, right through to the very last, to assist with your decisions as far as possible. Through our many years of experience in building personalized guitars, we can offer numerous useful tips and guidelines to reassure you in this process. The best overview of our Customshop System can be found by way of the Lakewood Guitar Designer. This is a 3D-configuration tool, which depicts the guitar graphically during the assembly of the various feature options in a realistic photographic format. More information is available under the respective menu items. Alternatively, you can preview the various feature options under the menu item Options which shows all the available choices in tabular form. Each Category contains a number of Feature Options each of which is shown photographically. Ultimately, the Lakewood Guitar Designer is the medium by which to save your selected guitar design in a convenient PDF format for further review later and finally to be ordered from your dealer. But enough said, let us begin by building you a beautiful guitar!